September 2 is the birthday of Hawai’i’s last reigning monarch, Lili’uokalani. Born in a grass house in 1838 and adopted by Hawai’i’s ruling dynasty, the infant girl who would become Hawai’i’s last queen began her tumultuous life 174 years ago at the base of an dormant volcano in Honolulu. For the past several years, historians, Hawaiian cultural practitioners, and others who keep Lili’uokalaini’s memory alive, have gathered at the grounds of ‘Iolani Palace on her birthday to lead walking historical walking tours in an event called Mai Poina (Don’t Forget.) The tour on her birthday sold out but there are still a few spots left this coming weekend, September 7-9. The story begins in November of 1957. The chief photographer for the Honolulu Star-Bulletin, Warren Roll, climbed into the passenger seat of a small plane in Kauai. The pilot took off, heading towards a 73-square-mile privately-owned Hawaiian island of Niihau. 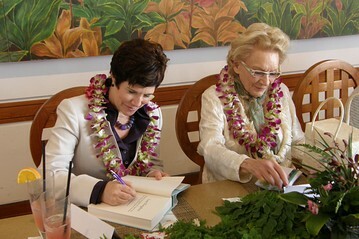 Julia Flynn Siler and Her Royal Highness Princess Abigail Kawananakoa. A few days before heading to Honolulu on book tour for “Lost Kingdom,” I got a phone call from the assistant to Her Royal Highness Princess Abigail Kawananakoa, the woman who is the most direct descendant of the last queen of Hawaii. If the monarchy had not been overthrown in 1893, Princess Abigail today might well have become Hawaii’s queen. Purely by chance, I found myself in the Washington, D.C. neighborhood where Hawai‘i’s last queen, Lili‘uokalani, had once lived. I was in Washington, D.C. to deliver a talk to a group of Treasury executives about my new book, Lost Kingdom: Hawaii’s Last Queen, the Sugar Kings, and America’s First Imperial Adventure. I’d booked a hotel near Dupont Circle. The evening after the Treasury talk, I was on my way to a dinner party thrown by a group of college friends and stopped at Cairo Wine & Liquor, a small shop a few blocks away from my hotel, to pick up a bottle of wine. On my last night in Honolulu on tour for my new book, Lost Kingdom, I was invited for drinks at the Outrigger Canoe Club, which sits at the far end of Waikiki Beach, in the shadow of Diamond Head. The club is a key setting for the novel, The Descendants, which is now an Oscar-winning film starring George Clooney. Mahalo nui loa – Hawaiian for thank you very much! – to the dozen or so book groups I’ve heard from around the country that have picked Lost Kingdom as their monthly or quarterly read. I’m truly grateful to all of you – from Liz Epstein’s Literary Masters groups (10 book groups in the San Francisco Bay Area) to Catherine Hartman’s lovely group of Stanford alum and other book-loving friends in Chicago to Jason Poole (The Accidental Hawaiian Crooner) who also organizes a reading group in Pittsburgh. I’m especially grateful to Julie Robinson of Literary Affairs, who organizes book events and moderates book groups in Beverly Hills and the Los Angeles area, for choosing Lost Kingdom as one of her recommended reads. Here are some questions to discuss on Lost Kingdom that come from Liz Epstein at Literary Masters. Hope they’re helpful and if you have other questions, I’d be delighted to skype or phone into your book group for a chat if my schedule permits. The famed Mavericks Surf Contest, which takes place in Half Moon Bay, California, is called each year by its organizers only when conditions are right. Last year, the waves were never big enough for the competition to take place. This year, it began on January 3rd, 2012, the same day as the publication date for my new book, Lost Kingdom. In the early hours of Sunday, December 7, 1941, seventy years ago, Japanese bombers launched a surprise attack against the US military base at Pearl Harbor. The devastating attack on Hawaii, which was then an American territory, profoundly shook the nation and hastened its entry into World War II.